We are proud to present the Mystery Tour Tuscany, a one day trip through charming villages, impregnable fortresses and timeless wonders. 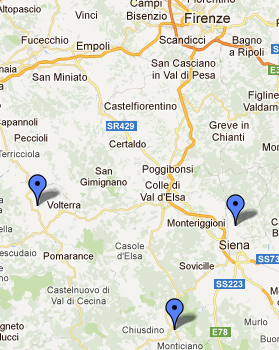 The tour begins in Volterra, where you will be introduced to the magic formulas used by earlier Tuscan witches. Keepers of ancient Etruscan ritual, their spells were able to dig deeper into the human soul. The tour begins in Siena, where you will have the chance to know, going through the Museum of Physiocrats, a short story of the Earth, between Etruscan Tombs, geological fossils, zoological session, astronomical, anatomical, botanical and then the mysterious Dome of Siena. The tour continues to Chiusdino looking for the origins of King Arthur’’s myth. Inside the round Chapel of Montesiepi is a unique wonder: an ancient sword set in stone. 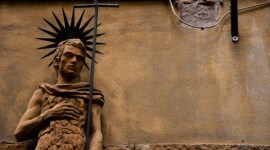 The sword is said to belong to Saint Galgano. 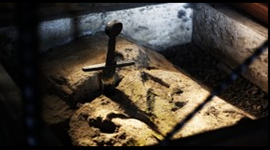 Legend has that Galgano Guidotti was a violent knight who later in life converted and lived in sanctity, renouncing his old ways by symbolically planting his sword in a stone, never to be retrieved. San Galgano Abbey, just down the hill from the Chapel of Montesiepi, is a magical place: a stone abbey whose roof is the sky and the stars. 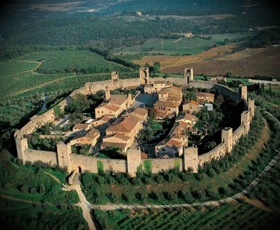 Finally, we will go to Monteriggioni, the crown of Italy. There, at night you can hear the poignant lament of a restless spirit. Someone thinks it is the cry of Captain Giovanni Zeti, once leader of Monteriggioni, still tormented by an unfortunate decision that led to the end of Monteriggioni. 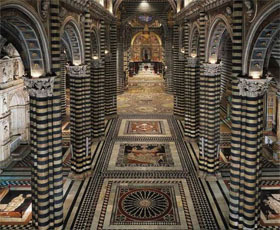 A guided visit to the Museum of Physiocrats and the Dome of Siena. 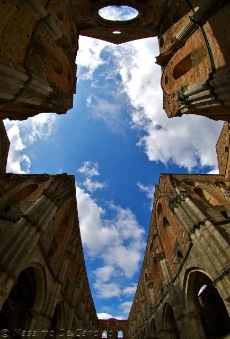 Visit to the Rotunda of Montesiepi and the roofless abbey of San Galgano. Visit to the medieval village of Monteriggioni and the walkways around the castle walls. On 12th June 1423 the religious and civil authorities of Volterra gather to put Elena da Travale on trial as she is retained “enchantress, soothsayer and sorceress”. The story of an illiterate woman capable to arouse the darkest hate and the most intense love as well as to attract the hopes and the envies of a whole community. The town was a Neolithic settlement and an important Etruscan center with an original civilization; it became a municipium in the Roman Age. The city was a bishop’s residence in the 5th century and its episcopal power was affirmed during the 12th century. With the decline of the episcopate, Volterra became a place of interest of the Florentines, whose forces conquered Volterra. Florentine rule was not always popular, and opposition occasionally broke into rebellion. When the Florentine Republic fell in 1530, Volterra came under the control of the Medici family and later followed the history of the Grand Duchy of Tuscany. A violent knight who then became a saint. A cathedral that opens up to the sky, knightly symbols and features recalling King Arthur.We are just a few kilometers from Siena, in Montesiepi, where for some 800 years now a unique prodigy has been conserved. Galgano’s sword in the stone. The abbey of Saint Galgano with the Montesiepi Rotunda are located in the valley of the river Merse, between the medieval villages of Chiusdino and Monticiano, in the province of Siena. Carolina will evoke the deeds of the knight who by turning his sword into a cross changed for good the real and fictional knightly world of the middle age. 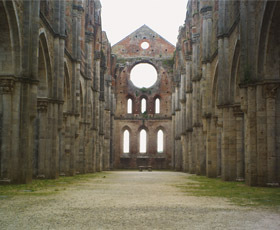 The original nucleus of the monastic complex Cistercian of Saint Galgano (Galgano Guidotti 1148-1181) is constituted by the hermitage of Montesiepi, built in Roman style as mausoleum of the Saint between the 1182 and the 1185. Its greater particularity is the so-called ‘the Rotunda of Saint Galgano’ that encloses, the tomb of the saint and the famous rock with the sword. Around 1218, the hermitage began to be too small to contain the monks and the pilgrims, so the Cistercian monks decided to build of a new imposing abbey in the form of a Latin cross. followed the history of the Grand Duchy of Tuscany. It’s 1554, the Florentine troupes are drawn up in great numbers at the foot of the hill of Monteriggioni ready to fire their cannons. The shots destroy a well leaving the village with little water. Frantic hours follow. Captain Zeti must decide whether to continue the fight or surrender. His decision will change the history of Tuscany and his own afterlife. Monteriggioni is a medieval walled town, located on a natural hillock, in the Siena Province of Tuscany – built by the Sienese in 1213 as a front line in their wars against Florence by assuming command of the Cassia Road running through the Val d’Elsa and Val Staggia to the west. Monteriggioni’s walls and the buildings that make up the town within are the best preserved example of their kind in all of Italy, attracting tourists, architects, medieval historians and archaeologists. The roughly circular walls, totaling a length of about 570 meters and following the natural contours of the hill, were built between 1213 and 1219. The Tuscan poet Dante Alighieri used the turrets of Monterrigioni to evoke the sight of the ring of giants encircling the Infernal abyss.